Millions of people will be gathering today all over the world to explain why action on climate change is needed urgently. Amongst them, Jeffery Archer, ex-MP turned novelist, stands out as one of the more authoritative witnesses to planetary vandalism. We caught up with him as he prepared to walk in New York. LFG: What is your greatest fear if we don’t act now to mitigate climate change? JA: There is a serious risk that we will allow our emissions to continue to soar for years to come, thereby blowing through far too much of our 2° “carbon budget” and putting ourselves in an impossible position later in the century. LFG: So, you’ve made it to New York to march – what can the rest of people do? JA: Inform yourselves, and understand the fact that actually, even though we’re up against huge difficulties, because fossil fuels are a very, very difficult thing to give up, we now understand that we cannot afford to use them any more – it’s as simple as that. LFG: And what can governments do? JA: To have even a 50/50 chance of hitting the 2° target (which many scientists warn already involves facing an array of hugely damaging climate impacts), the industrialised countries need to start cutting their greenhouse-gas emissions by something like 10 per cent a year – and they need to start right now. Only an enlightened despot can push through the measures needed to navigate the 21st century safely. The problem isn’t just governance. Conventional economics overlooks what happens at the end of the century, or assumes future generations will be richer, so we needn’t make sacrifices on their behalf. But can we be sure growth will continue? Shouldn’t we worry about “worst case” climate scenarios? The despot would willingly pay a higher insurance premium to guard against future catastrophes; he or she would generate a vast “sovereign wealth fund” to finance infrastructure and research and development at low interest rates. LFG: You’re now on book four of your ‘Clifton’ series of novels. Has it been daunting writing such a sweeping, historical saga? JA: It has. Even though I planned The Clifton Chronicles to be a five-book family saga that would span a century, from 1920 to 2020, I had no idea what a daunting task I was taking on. When I sat down to write the opening paragraph of volume one, Only Time Will Tell, I knew little more than the tale would follow the life of Harry Clifton, a lad born to a family of dockers in the back streets of Bristol, who would, at the age of seven, discover he had a remarkable talent that would change his whole life. By the end of the first book, in 1938, Harry would have won a place at Oxford, but then he has to decide if he should continue his studies, or sign up to fight in World War II. In fact, on my recent world tour to India, Hong Kong, Australia, New Zealand and Singapore to promote Only Time Will Tell, an Australian lady in Sydney asked me if I’d already written all five books. I wish. I follow a ruthless and disciplined routine, otherwise nothing would ever get done. I rise around 5.30am, and start work at 6am. I write four two-hour sessions a day: 6-8, 10-12, 2-4, 6-8. Even the breaks are well organised – long walks and light meals during the day, and a DVD I’ve been saving, sometimes for months, during the evening (maybe 36 episodes of The West Wing, or 12 episodes of Mad Men). The first draft of a novel usually takes around 50 days (400 hours). I then have a break for about a month, when I rejoin the real world; regular visits to the theatre, art galleries, charity auctions, cricket and rugby (according to the season), and of course just reading and catching up with friends. Four weeks later, I begin the whole process again, and nine months later, I will have done about 14 drafts (1,000 hours) and then hand over to my publisher what will be a 400-page book. Yes, almost two-and-a-half hours a page. And to make matters more difficult for myself, I write every word by hand, because I can’t type and don’t own a laptop. The reason readers ask me this question more than any other is because the person asking often wants to write a book, and even more – though they would never admit it – wants their book to be a number one bestseller. They’ve read novels by Dan Brown, James Patterson and Stephenie Meyer, and say, why not me? And why not indeed? But should you decide to go down that road, beware, because there’s a great deal of difference between being a writer and a storyteller. A writer is someone who is well educated, well read, and has a good command of language, whereas being able to tell a story is a God-given gift. When you combine both writer and storyteller, something that is extraordinarily rare, you get a Charles Dickens, Jane Austen or Thomas Hardy; three authors you may have read and enjoyed, or at least seen on television or in the cinema. But how many of you have read Patrick White, Nadine Gordimer or Doris Lessing? And they have all won the Nobel Prize for Literature. So first you have to decide, are you a writer or a storyteller? If you’re a storyteller, it doesn’t matter if you’re male or female, black or white, short or tall, or even what job you did before you decided to write that bestselling book. LFG: Will climate change perhaps feature in any future instalments of the Clifton Chronicles? JA: Yes, I think it probably will. 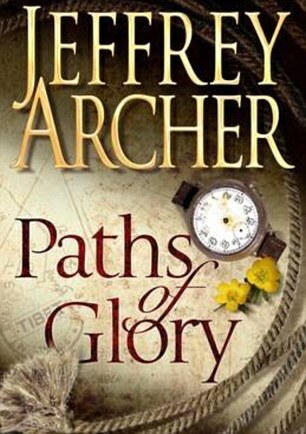 I love Jeffery Archer. And I have loved him. He f*cked me up the bum, once.